The riving knife on a table saw is a vital piece of safety equipment for the tool. A riving knife is a flat piece of metal that is mounted just aft of the saw blade. When you push a workpiece through the saw blade, the riving knife is designed to keep the two cut sections of the board from closing up, thus pinching the saw blade and causing dangerous kickback. Rip cuts are especially prone to kickbacks, and it is here that the riving knife is most important. Even though a riving knife is effective in reducing the possibility of a kickback, it cannot prevent it entirely, which is why it is always advisable to follow the basic rules of use for a table saw: Wear appropriate clothing, use properly approved safety glasses and hearing protection when necessary, keep your hands safely away from the saw blade, and stand in a manner so that if the board does somehow kick back, you'll be less likely to sustain an injury. On most table saws, the riving knife mounts to the saw's trunnion— the sturdy mechanism beneath the saw table that raises and lowers the saw blade. Typically, the riving knife has a release mechanism that can be accessed by removing the table insert from the top of the saw table. In many cases, this release mechanism allows the riving knife to be adjusted higher or lower in relation to the saw blade, and the knife typically is shaped so that the gap between the blade's cutting teeth and the edge of the knife is less than 1/4 inch. This allows for maximum effectiveness when keeping the two halves of a freshly cut board separated as it is pushed through the blade. Normally the riving knife raises and lowers along with the saw blade as its depth is adjusted, allowing the riving knife to "hug" the blade no matter what position it is in. 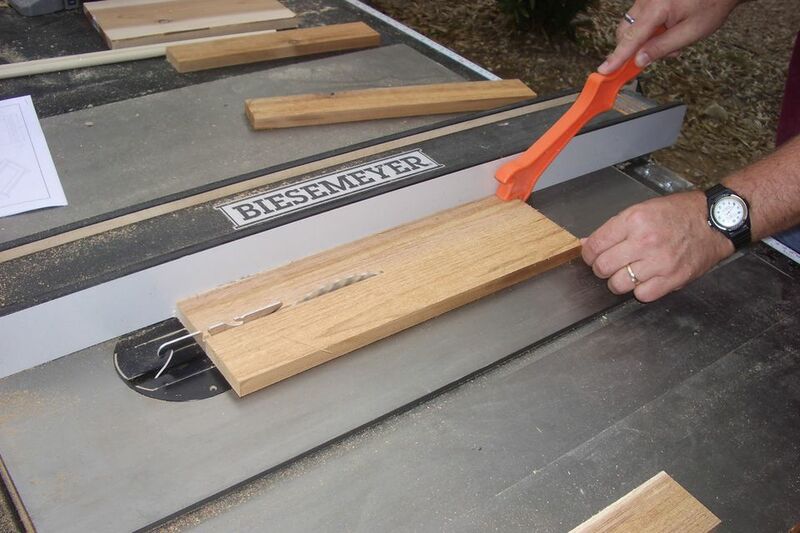 Unlike a splitter, which must be removed from the saw for crosscutting, a riving knife can remain in place for crosscuts and any type of cut where the saw kerf runs entirely through the thickness of the board. There very few instances in which the riving knife is not appropriate. When you watch woodworking shows on TV, you'll often see that the riving knife, anti-kickback pawls, and blade guards have been removed. This is done to make viewing the steps involved easier to view on television, but it does a bit of a disservice to the novice woodworker by implying to woodworkers that it's acceptable to remove these safety devices. But there are times when you simply must remove the riving knife, or when it is inappropriate to use one. A good example is when using a stacked dado blade to cut a dado or a rabbet. Because this type of blade does not create a through cut, a riving knife would serve no purpose. In fact, it would actually get in the way, blocking the completion of the cut. Additionally, since most table saws use a 10-inch diameter blade, but most stacked dado blades are 8-inches in diameter, there would be at least a one-inch gap between the edge of the stacked dado blade and the riving knife, which would essentially render the riving knife useless. In nearly every other case, though, the riving knife should be used when making standard rip cuts and crosscuts with your table saw. It is unobtrusive and when used in conjunction with other safety features, it makes using your table saw much safer.